Emily has a party to attend tomorrow for a friend who loves horses. So naturally I had to make a horse toy. A search of Etsy led me to a shop called Rustic Horseshoe. 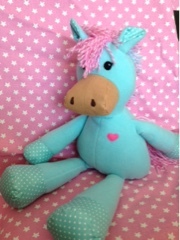 It's got loads of patterns for sewing hobby horses and some cuddly horses too. This pattern, the Natty Nag, was on sale so it was like fate meant for me to buy it! It's a very well written pattern. All the steps are clearly explained and there are loads of photos in the tutorial to help. I would definitely recommend Rena's patterns to anyone looking for horse sewing patterns. Now I just hope the birthday girl likes her gift. I've posted many photos over the last few years of little girls dresses. 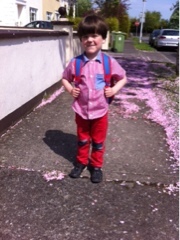 But this week I made my first little boy's shirt and I think I am converted to loving boys clothes. This shirt is so stinkin' cute! My little man is so happy with it and wants to wear it every day. It doesn't get much better than that! Its been a tough two weeks for me - I got vertigo, probably from a viral infection in my inner ear, and its very very slow to clear up. Rest as sure I have plans for new patterns, and one that just needs to be typed up, I just need to get the energy to do them. On one good day last week I set up an event on Facebook for a Market Night tonight. With the sickness I haven't finished as many toys as I would have wished, but there are a few up for sale. Miss Aine Click on the link if you're interested in buying a Miss Aine toy. The Market Night starts at 9pm GMT tonight.